Hi everyone, Sarah here. 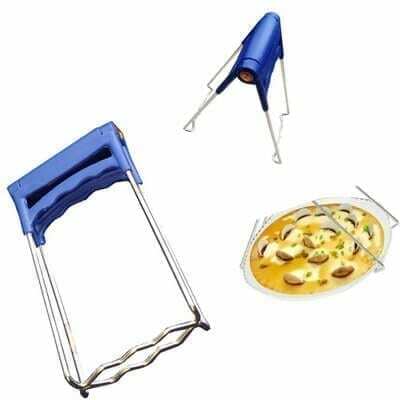 Welcome to our Chinese Cooking Tools page! We use these things in our kitchen every day. That said, you don’t absolutely need any of these items to cook from our blog. 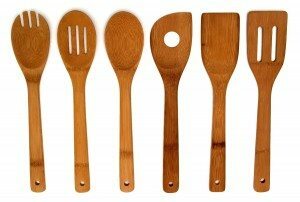 But if you’re interested in broadening your base of kitchen equipment, here are some of the basic tools that we use and recommend. Not everything here is specifically in the category of Chinese cooking tools, but may be useful to preparing Chinese recipes all the same! All of our recipes reference this Chinese cooking tools page whenever we use them. 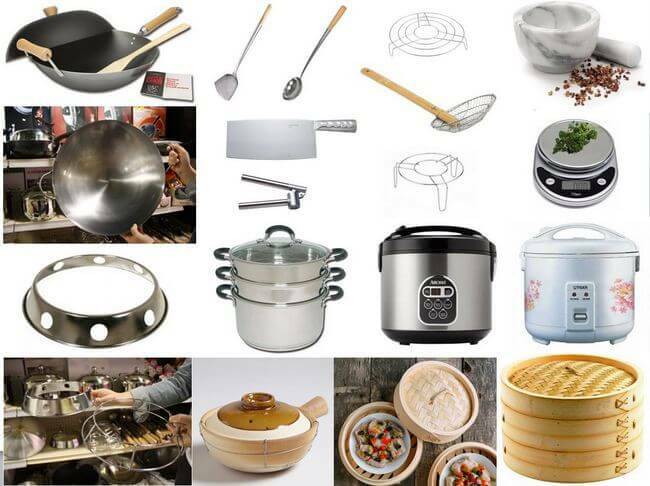 We provide detailed directions an how to use these Chinese cooking tools in our recipe posts and when you click on any cooking tool link, it will open this tools page and jump to the specific Chinese cooking tool that is used. 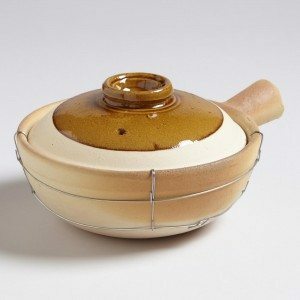 Take advantage of this gallery of Chinese cooking equipment and other useful kitchen tools and we are sure you will learn some new skills! We do have some Amazon links on this page so you can check prices on our recommendations. We are a participant in the Amazon Services LLC Associates Program, an affiliate advertising program designed to provide a means for us to earn fees by linking to Amazon.com and affiliated sites. You’ll also need a handy wok lid for steaming, boiling, and bringing up the temperature for things that need a bit of a longer cooking time. When in doubt, whip out your wok! Ok, so don’t be tempted to get a non-stick model. At the temperatures required for Chinese cooking, these are of questionable safety. Don’t start a fire, but don’t be afraid to heat that thing up, either! The wok is the heart of any Chinese kitchen. Just make sure you find a good one. On the left is a picture of a wok similar to the one we have in our NJ kitchen, which you can see in a couple of our recipes, like this fried rice. On the right is a carbon steel set from Amazon, which has some pretty great reviews. Whatever wok you choose, know that you’re making a significant investment! We’ve owned several woks for years and years. Our NJ wok is over 40 years old! 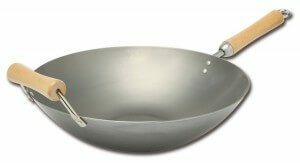 Amazon is a great source to shop for anything, woks included so Click HERE to go wok shopping now! Check our our post on What is the Best Wok to Buy for detailed explanations on selecting and buying a wok and if you decide to go with a carbon steel wok, check out our post on How to Season a Wok to season it before use and tips for daily care to build a non-stick patina! These days, some ranges come with a big wok burner, which has that bigger flame needed for authentic Chinese cooking. I think we’re the only one we know who has one of these (not everyone wants THAT big a burner on their stove, I’m sure. We’re just crazy. If you want to get an idea of what it looks like, check out this older post). 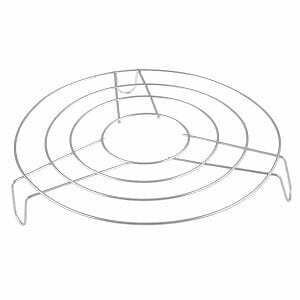 Anyway, if you have a regular-sized gas or electric stove, you may want to consider investing in a wok ring. These aren’t strictly necessary, but helpful nevertheless. 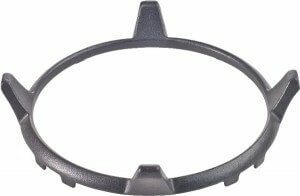 A wok ring sits on top of your existing burner and ensures that your wok won’t slide around while you’re cooking. Personally, we don’t use one and I don’t think it’s all that necessary if you have a cast iron or steel grate on your gas range, but that doesn’t mean it’s not useful. You make the call on this one. Chinese cooking requires a good metal spatula. For most stir-fries you can use any run-of-the-mill implement you have lying around (made out of wood or metal), but for things like fried rice, glutinous rice cakes, or anything you’re making in large amounts that might stick to your wok, it’s handy to have a sturdy metal spatula that really scrapes up the tasty bits on the bottom of the pan and can handle large amounts of food with one flick of your wrist. 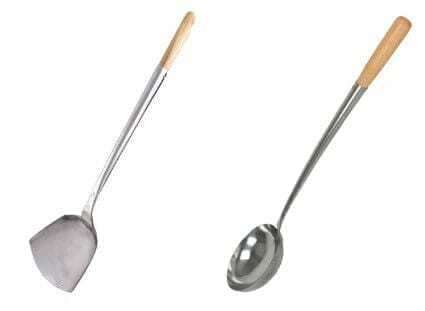 There is a good traditional spatula and hoak set on Amazon that I think is quite authentic. The 14 inch length is a good size for home use and the ones pictured below are 14″ Stainless Hand-tooled Wok Chuan & Hoak (Spatula & Ladle) Set. It’s a bit expensive online so you may want to check your local Asian store where you can check the price and the look and feel for this and many other Chinese cooking tools in person. Prices and availability vary in local stores so Amazon may still be the right way to go if you are like us and love to have things just show up on your doorstep! We found only the metal spatula but no hoak at one of the local stores in NJ. 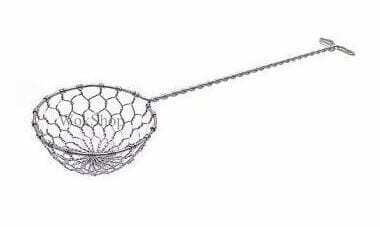 This Chinese spider/strainer is great for frying or straining and is commonly seen in many Chinatown restaurants. These days, however, any strainer or even a slotted spoon for frying or draining liquid from wontons or dumplings will do just fine. We use a variety of strainers in The Woks of Life kitchen including the traditional Chinese spider pictured below. It’s perfect for scooping egg roll filling out of the wok as you can see in our Egg Roll recipe – just like the Chinese cooking tools used in Chinese restaurants! I am sure you will use it for frying like we do every year when making crispy shrimp chips for Chinese New year! These strainers are essential during deep frying to remove fine food bits and particles which may burn and spoil your oil. They also help decant the oil after frying for reuse. There are many other uses for a very fine mesh strainer, including straining your egg custard mixture when making Hong Kong Egg Tarts—the absolute KEY to a glassy, smooth tart. You’ll be glad you invested in this handy tool when you use it the first time. It also comes in handy for straining stocks and broth and also for keeping your frying oil clean and free of batter particles that tend to burn if left in the oil. 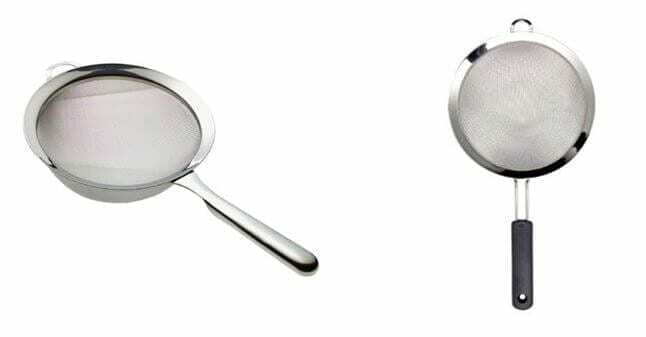 Use this fine mesh strainer to strain your oil while you’re frying and definitely after you are done so you have clean oil for your next deep fried dish. 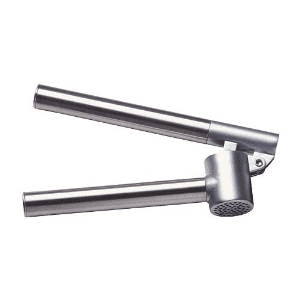 The tool pictured below is the OXO Good Grips 8-Inch Double Rod Strainer but there are many choices out there that come in different sizes and brands. It’s one of those tools that has very specific uses but when the time comes to use it, you will be happy that you have one in your arsenal! Without a doubt, this will save you the most headaches in the kitchen and is the most essential of all electronic Chinese cooking tools. Rice cookers these days come in a variety of styles and price points. Some have tons of different settings (for cooking different kinds of rice, porridges, and the like), while others just have an on and off button. Whatever your preference is, one of these babies will make sure you have perfect rice waiting for you every time. Our collective experiences says, save your money and pass on the multi-purpose units and go with a single purpose rice cooker. Rice cookers really vary and can get very expensive, but this Aroma cooker is a number one best seller on Amazon and is a great value, especially if you’re a first time purchaser! I seriously cooked entire meals on a regular basis in one of these in the corner of my college dorm room. 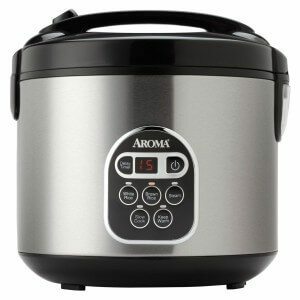 This Aroma 4-Cup (Uncooked) 8-Cup (Cooked) Digital Rice Cooker and Food Steamer works great and is very economically priced! 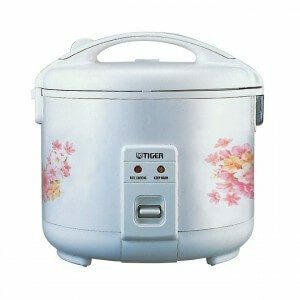 Tiger brand rice cookers like the one pictured below, Tiger America 10 c. Elec Rice Cooker/Food St ( JNP-1800 ), are some of the best and most reliable–though also pretty pricey! There are so many brands to choose from with different features and sizes so it is definitely worth it to do some browsing and shopping. We have a great post on How to Cook Rice Without a Rice Cooker that is definitely worth the read but pressing a button to get the perfect rice every time without any fussing is definitely worth the purchase! Click HERE to shop for a Rice Cooker and you will have perfect rice every time! Get ready for the fall and winter season and order your hot pot today! For more information on this popular Chinese meal, see our Hot Pot How-to page. 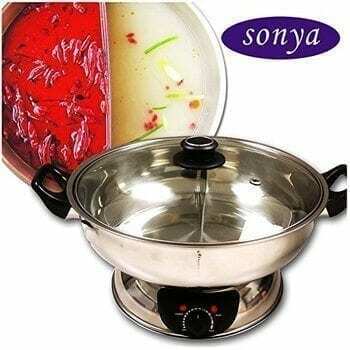 The sonya hot Pot pictured below – Sonya Shabu Shabu Hot Pot Electric Mongolian Hot Pot W/DIVIDER is a good choice but there are many products to choose from so we encourage you to shop around! 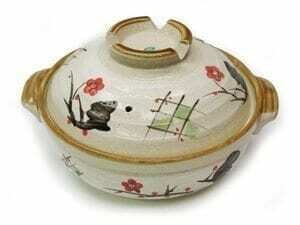 Click HERE to shop for a Chinese Hot Pot! Everyone will need some skimmers to fish out their food from the hotpot before it disappears into the deep! 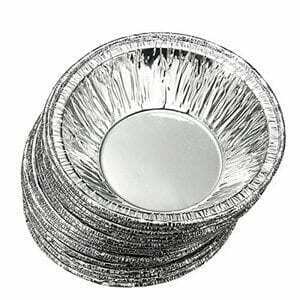 Be sure you get a set of these for your next Hot Pot meal. A lot of people just think of stir fries when they think of Chinese food, but many dishes involve steaming as well (e.g. steamed fish, buns, shumai, etc., etc.). A metal steaming rack can go in the bottom of a deep pot or in your wok to hold up a heatproof dish full of delicious steamables. If you are using your wok to steam a larger plate of fish, then this more shallow rack will likely work better and is worth the money. Before I got this rack, I had to use a couple of bamboo chopsticks at the bottom of the wok to hold the plate. 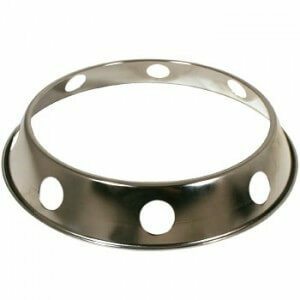 When my dad was young, my grandfather used to use an empty tuna can with the top taken off one side and hole punched on the other. If you’re on a budget or you can’t find one of these, either of those methods works also! 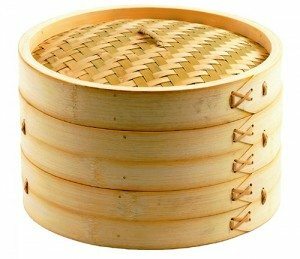 The bamboo steamer allows you to make multiple dishes at once by stacking layer upon layer of bamboo racks, requiring only one burner and one wok. Each dish (set in its own rack) can be cooked in its own time, and several layers can be added. One set consists of two racks and one lid, but you can get as many as you need. We use the steamer most often to steam dumplings and buns. Just place your steamer in the wok, fill the wok with water until it comes up to about half an inch on your steamer. Then line each level of the steamer with a layer of thin napa cabbage leaves or cheese cloth, place the dumplings two inches apart on each tier, and steam to perfection! 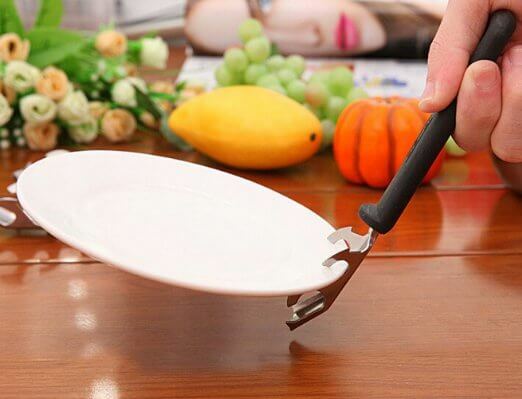 Once your food is cooked, you also have an instant, impressive serving platter. They come in various sizes. You’re going to want a large one, around 10 inches across. There are a selection of them on Amazon and you can see that they vary in price so happy shopping! Judy (aka my mother) has sworn off the use of the microwaves. I’ve given up trying to innocently melt a stick of butter in there or reheat yesterday’s leftovers. I’ve been caught too many times at this point. So…what’s the best way to reheat things then? 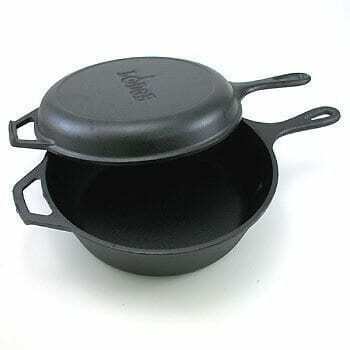 For things that need to be crispy, we just heat up the wok, cast iron pan or sauté pan. For most everything else, we use this multi-level steamer to reheat leftovers, including rice, veggies, pasta, lasagna or whatever. It’s actually extremely fast and effective. We also use it steam vegetables, melt butter, and reconstitute old, dried out brown sugar. It’s a really great tool to have in the house, and it probably is a lot healthier than the microwave oven. Because it’s metal, it’s much easier to clean and maintain than the bamboo steamer, making it perfect for everyday use. Did you ever wonder how you were going to lift a hot plate from your steamer in tight quarters or burning yourself while doing it? This tool makes things a whole lot easier for smaller sized plates and dishes and we use tools like this one often in our kitchen. Another plate lifter that really works is this interesting looking gadget pictured below. We think it is better than the plier-like tongs that require a strong hand and grip strength to use. Check this one out if you do user a steamer often! We think this Blendtec blender is a lifetime blender because unless you take it to China and plug it into a 220 volt outlet by mistake (yup, it did happen and it was scarry! 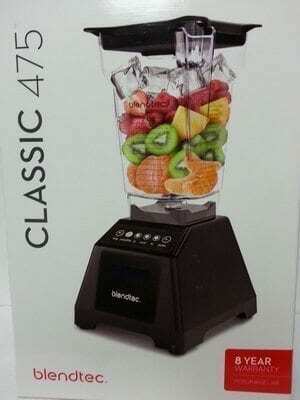 ), this could be the last blender you’ll buy. Take it from a family who have gone through multiple blenders that were either not up to the job or just burned out. We actually purchased the classic model which works great for frozen fruit and ice smoothies but it also makes short work of making powdered or castor sugar from granulated sugar in a pinch or making whole grain flour from whole grains for our favorite Homemade multi-grain bread and Homemade multi-grain English muffins recipes. The Blendtec classic has an 8 year warranty which is why we purchased it although the newer models do look enticing. Blendtec is definitely a high end blender that got infamous for blending an entire Apple ipad as an advertising stunt. It’s not cheap but worth saving for and is a pleasure to use. Definitely do your research and while we often question ourselves if we should have bought a Vitamix blender, that feeling goes away after we use our Blendtec. These are key for hearty winter stews, soups, and bubbling dishes of eggplant or tofu. They go right from the stove to the table too! So far, it’s best use on our blog in this Hong Kong Clay Pot Rice and the Chicken and mushroom clay pot recipes. 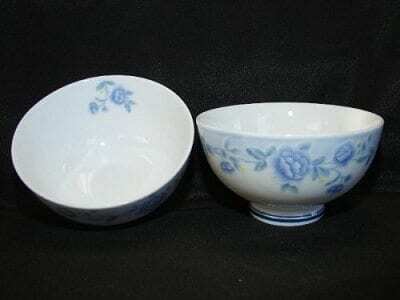 Decorative Earthen Pots are also available and double and a more attractive serving vessel. Shown below are one of many varieties and designs available so keep on the look-out for a nice one at your local Asian store, or if you’re traveling abroad in China or Asia! Remember that for any clay or earthen, be sure to soak it fully submerged in water for at least 24 hours before using it. We’re not sure of the science but all of the shop owners we encountered say this step is required before use and it is easy enough to do it.! Every serious cook needs one of these cast iron roasting pots. I use the term loosely because truthfully, we really don’t “need” most things per se but this pot is definitely the best for stews and cooking Whole Braised Ducks and Soy sauce Chickens. You can even use them to make rustic breads in the oven which a good friend of mine does all of the time. 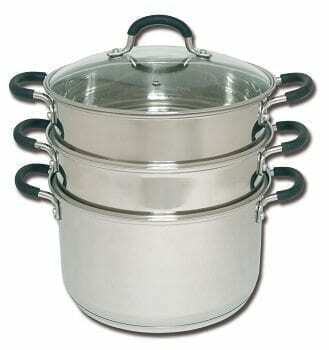 Shown here is an oval pot which we think is more versatile – like braising a whole duck or poaching a whole fish. 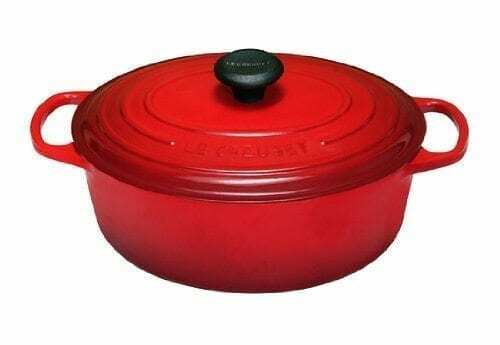 Do some shopping and investigation on this one because a good enameled pot like this one from Le Creuset is not cheap but one of those items you “need”! If you plan to make Cantonese Roast Pork Belly or are the ultimate kitchen gadget person, then invest in one of these cool tools, the Orblue manual meat tenderizer! The ultimate tool for slicing, dicing, chopping, scraping, and scooping—Chinese-style cleavers have it all. Rather than having a large set of knives of different sizes and shapes, Chinese chefs often just use this ONE tool for everything. It’s all about how you manipulate it to get different results. One fell swoop and it powers through pork bones. After a quick wash, it can slice onions or a block of tofu ever-so-delicately too. Knife selection can be a very personal choice, and it is always best to buy these things in a store. But if you can’t find one, this model is both economical and useful for more heavy duty chopping, and the low price makes it almost a no-brainer. That said, you absolutely don’t need this knife to cook the dishes on this blog. Most of the cutting that you will do for Chinese cooking can be done with a conventional knife. If you are interested in acquiring one of these, definitely shop around. In a pinch, my dad has used this cleaver to cut kindling…so that should give you an idea of the durability. There’s nothing more dangerous in the kitchen than a dull knife! My dad likes to get the sharpening stones out every once in a while but we’ve had this simple knife sharpener for a long time and it does the job quickly and easily for most knives. I’ve seen my dad use it too! For those of you who have used a sharpening steel before, we highly recommend this Wusthof model. It has a wider shape instead of the more common round version. This tool is definitely a luxury, but it is worth the money if you are a fanatic like my dad. In my opinion, it’s much easier to use than the round version and is a godsend when you just need a little more edge while you’re working on the cutting board. Get a good pair of kitchen shears and you’ll wonder how you lived without it. 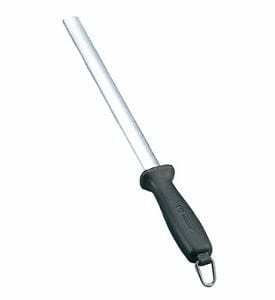 Trim fish fins, shellfish, cut raw or cooked poultry, or even flowers, quickly and safely. You can maneuver a pair of sharp shears much more effectively and safely than a chef’s knife. Depending on how much cooking you do, our recommendation is to buy a professional one and it will be a pleasure each time you use it and will last you for years! We have used this model below for years, like the simplicity of the design and have really never had the need to sharpen it. It is an essential tool for the avid cook and gardener. We harvest many vegetables and crops with this durable shear every season! We use multiple colanders in our kitchen and on a busy day we use them all! 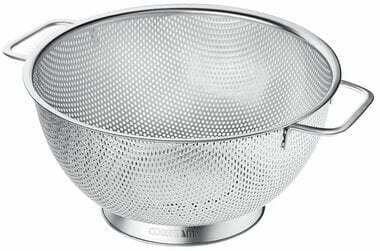 We have a variety of them that are fine mesh, copper plated, decorative plastic and stainless steel but our colander of choice is stainless steel because it is durable and easy to clean. CLick HERE to shop for colander or even two! In the old days and even today, Chinese cooks would use a pine tree cutting board because it was soft and easy on the cleaver and perfect for meats. You may be able to see this today in some Chinese restaurants where they sell roasted meats and cut them to order. 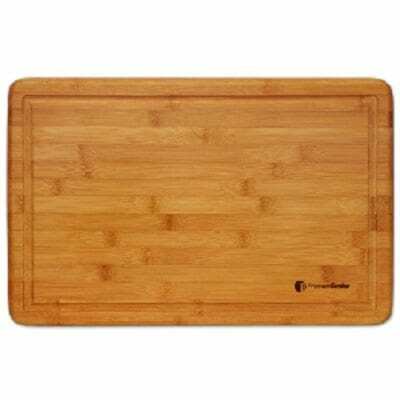 A more practical, readily available choice is a large rectangular bamboo cutting board, which is quite versatile, and very easy to clean. The one below that we use is great and has a groove around the board to catch excess liquid before it can drip off the board and onto the counter – very handy! We have an Ikea garlic press that we bought at the IKEA in Beijing. It’s available on Amazon as well. The price is decent and it works great. It’s the best for avoiding garlicky fingers and I have to say, chopping large amounts of garlic is probably my least favorite kitchen task ever. There is a LOT of garlic involved in Chinese cooking. Okay, okay–technically, most definitely not “Chinese,” but it’s great for grating ginger and garlic, excellent for zesting, and perfect for parmesan cheese. 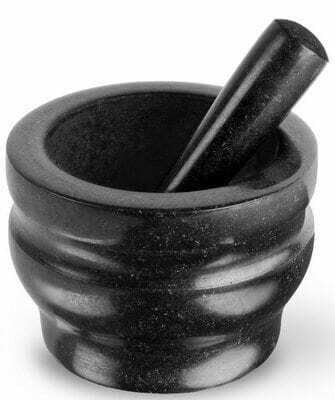 Great for grating ginger and spices, and excellent for zesting, I swear by this thing. It’ll make all your other graters and zesters blush with embarrassment at their inadequacy. Sometimes you just need a simpler box grater for quick and easy shredding or to grate some ginger. 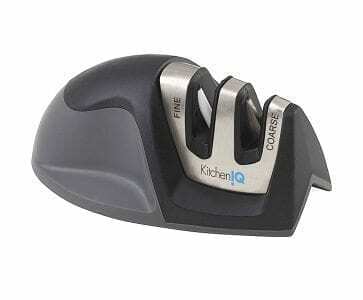 They are inexpensive and essential in the kitchen for quick and easy tasks. 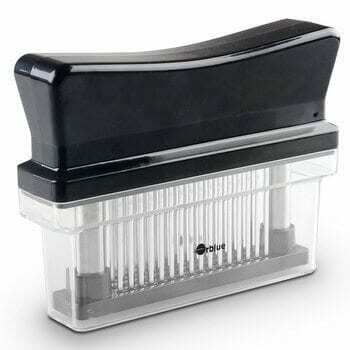 Click HERE to shop for a box grater now! We have learned over the years that electrics are really worth using for Chinese cooking and we love the Cuisinart processor and have been using one for years. 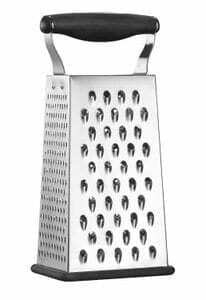 Honestly, the only reason for not taking this out for use is the consequence of cleaning it up so sometimes we just use the traditional box grater or even the microplane! 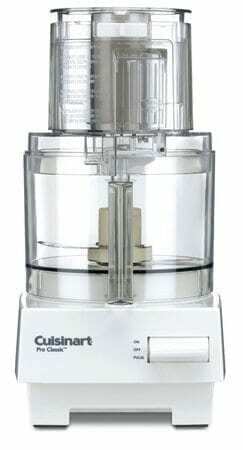 Click HERE for to shop for a food processor now! Mandoline slicers are great for slicing large quantities of vegetables or even if you just want thin or julienne slices. They are easy to use and worth the effort although you must be careful when using these sharp tools! Judy uses one often, especially when cooking Sichuan Stir-Fried Potatoes. If you are a novice cook or just trying to perfect your knife skills, these gloves may be just what you need in the kitchen to build your confidence. Even professional chefs use them in high stress environments when risks of cutting yourself are high! 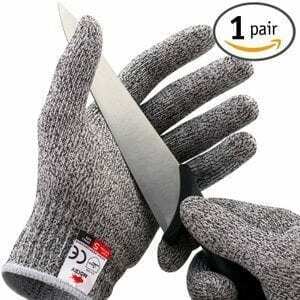 NoCry Cut Resistant Gloves – High Performance Level 5 Protection, Food Grade. Size Medium. Free Ebook Included! 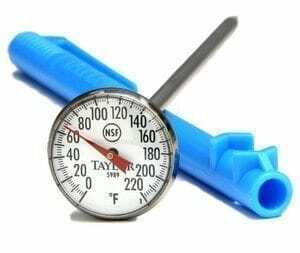 This thermometer is an essential tool to ensure that you are deep frying at the right temperatures. I bet you have heard many people say, and this includes my grandmother, “just look at a bamboo chopstick in the oil and when it bubbles, it is the right temperature”, or maybe you’ve heard – “toss a potato in the oil and when it browns, the temperature is right.” These are people speaking from lots of experience in the kitchen and you can definitely go by feel and still get good results but why guess and risk ruining your dish? This is one of the best purchases we have made for frying and it’s very safe with the long design that keeps a good distance from the hot oil. You will be glad you have one after you have used it a few times! This meat thermometer is all you really need for testing internal meat temperatures. It is used by professionals and easy to carry in you pocket, very economical and we have used this one in our kitchen for years. Follow the link below to check it out on Amazon and you’ll also see a slew of fancier electronic ones if you’re a techno gadget person! 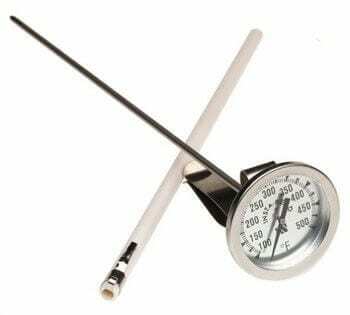 It’s an essential tool for serious cooks, just like the deep dry thermometer shown above so go out and get one now. We love using sheet pans at home because they are so versatile and useful and the professionals can’t be wrong. Every commercial kitchen uses sheet pans but at home a half sheet pan is the perfect size with many uses. 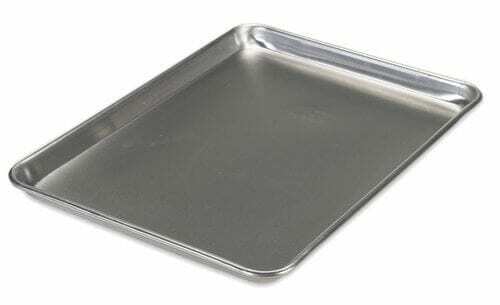 First, this aluminum pan is perfect for making any cookies or any of our Chinese Bakery or milk bread recipes and we have been using it for years. 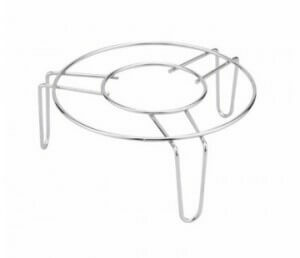 Second, add a roasting rack and it is perfect for roasting Chinese spare ribs, chicken wings, Roast pork or even small roasts that require the meat to be elevated and roasted above a little water rather than sit in the pan. The edges are an inch high so nothing runs off the pan. Buy yourself some heavy duty foil to line the pan, roast away, discard the foil and you’re done! 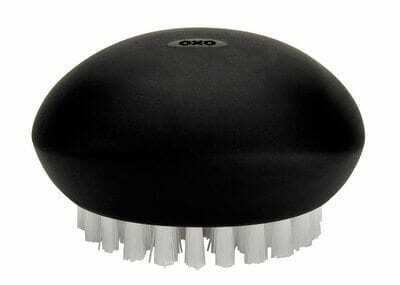 Our third favorite use is to use it for dredging or cooling fried items where oil is easily drained. Just place a folded kitchen towel on one side and any excess oil flows to one side and your food is free of excess oil! We have three of these pans and on a good cooking day, they are all out and being used! 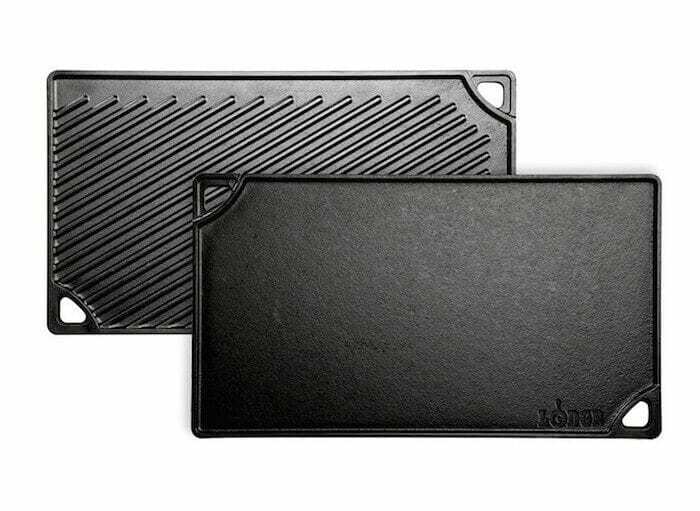 This stainless steel cooling rack is an essential tool that goes hand-in-hand with your sheet pans. Use as a cooling rack for all of your baked goods or together with your half sheet pan and you have the perfect roasting setup to make your roasted meats. 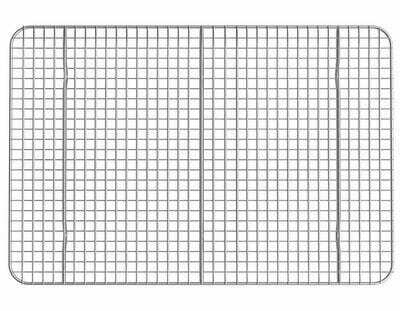 The 10 x 15 size fits nicely into a half sheet pan with just enough space around the edges to make your roasting setup easy to handle. The stainless steel finish is long lasting and easy to clean and you’ll wonder what took you so long to acquire this rack and a half sheet pan for your kitchen! These aluminum tart tins are just awesome for making Hong Kong egg tarts. We used to save up our tins, wash them and reuse them for baking which is a good frugal practice but purchasing a batch of these for making Hong Kong Egg Tarts or any other mini tart recipe is truly worth the money! 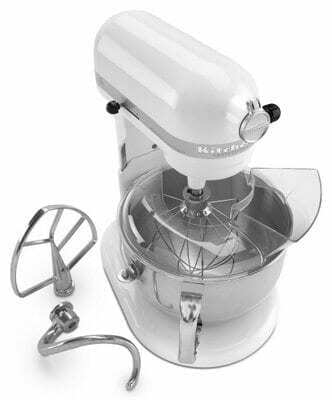 This Kitchen Aid Stand mixer is an essential tool that you must save up for if you are a serous cook, baker, foodie, and if you want to make our milk bread and the best chocolate cake recipe you have ever had! We own an older model for over 20 years now and it is still going so not much else to say other than we highly recommend it. There are lots of models out there and you may be tempted to go with a cheaper model but we are really happy that we went with the professional series stand mixer that has the arm to lower and raise the bowl. It is totally worth the cabinet space needed to store it or you can buy one of the twenty-four colors that it comes in and leave it out on your counter for all to marvel at! Now this inn’t Chinese either but it is great for measuring ingredients and especially if you are looking at recipes of international origin. We use this scale almost every time we cook whether it is for measuring meats or for baking. 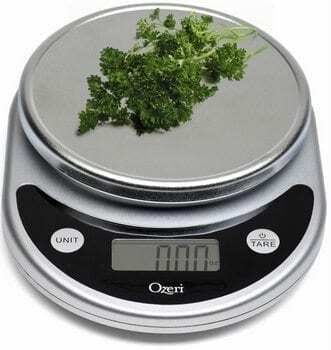 The scale has a great feature to zero out the plate or container. Just set the container on top of the scale, hit the button and you’re at zero and you can now add ingredients into the container or onto the plate. It doesn’t sound like much but it is key and this scale is a bargain. Get one and you’ll wonder how you were cooking without it! 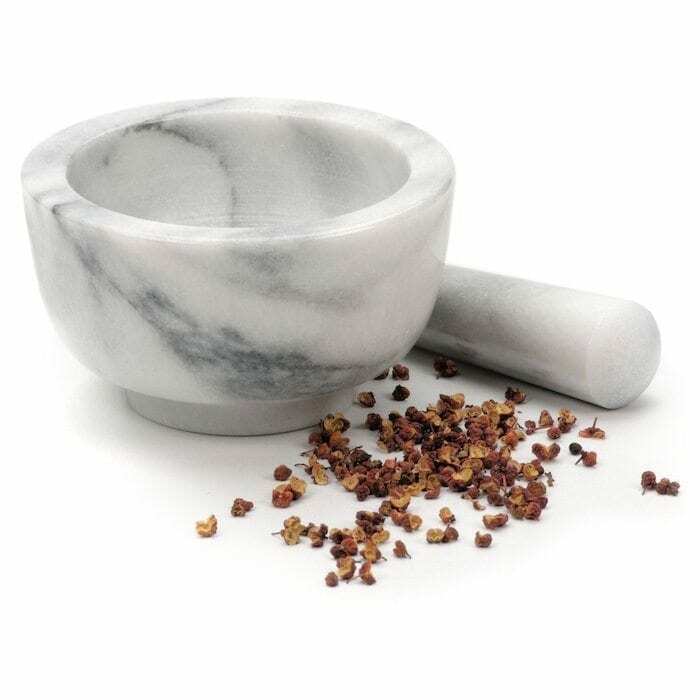 A mortar and pestle is an incredibly useful tool in the kitchen. It’s a necessity for quickly crushing spices like cumin and peppercorns (check out this recipe for chili cumin Beijing lamb skewers!) and pulverizing garlic, onions, and herbs. 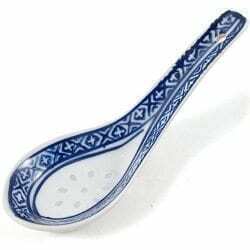 Believe me, once you have this tool in your kitchen, you will find countless uses and wonder how you lived without it for so long. We recently added this larger granite one for heavy duty grinding. It makes things quite a bit easier! We have been using different types of vegetable brushes for years now for potatoes, carrots, tomatoes and the list goes on. It’s inexpensive and cleans your veggies and fruits removing any residual pesticides better than just rinsing over water. You want one of these inexpensive items and it’s a great item to add to your order to put you into the free shipping realm. Purchase one for your loved ones and they will appreciate it. Need we explain? The ultimate utensil—they can pick up anything from a single grain of rice to an entire chicken (it’s tricky, but it can be done). Expand your utensil horizons or at least you can have a set for eating any Asian meals! We like the bamboo and wood versions over the slippery metal and plastic composite versions. They are a bit more of hassle to clean than the smooth metal and plastic, but they just feel so much more comfortable in the hand and even the most skilled practitioner could get frustrated with them. I know that a lot of Koreans would argue with me on this one but hey. I’m Chinese. Give me my bamboo, and I’m happy. 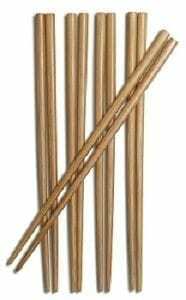 These handy bamboo skewers are great for grilling. Skewer your shrimp for your Shrimp Tacos and use them for a Beijing favorite – Spicy lamb skewers – Yangrou Chuan on the grill. Just remember to soak them overnight for best results before using them or they will burn on the grill. Great for everyday stirring and mixing needs. They don’t absorb flavors, colors, and liquids as easily as your average wooden spoon (I still have a wooden spoon that’s all splotchy pink from a beet salad), and don’t conduct all the heat from your wok like your metal spatula. We use these bamboo utensils interchangeably with the wok spatula and at times even prefer them over the metal ones for stir-fry. You probably have one of these already in your kitchen but if not, you should pick one up so you can make a whole lot of scallion pancakes and buns. 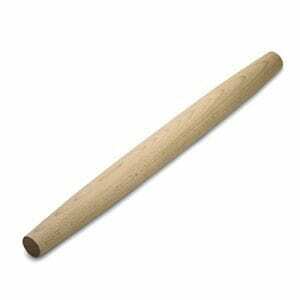 We like using the tapered French-style rolling pins rather than the traditional rolling pins with the handles. They just allow a lot more flexibility. Here in China, the rolling pins don’t have handles either. 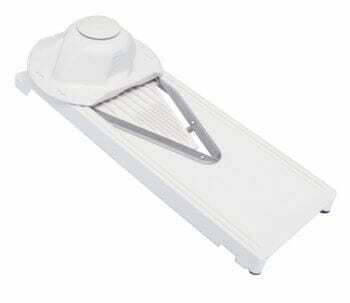 If you buy a rice cooker, it will come with a rice paddle–usually made of plastic. 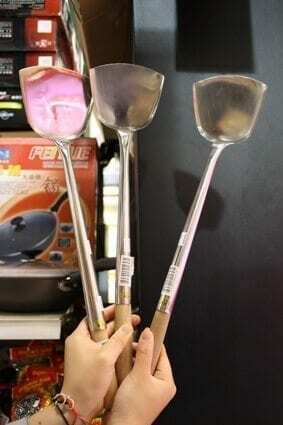 These allow you to spoon out your rice without scratching the surface of the rice cooker bowl. They also are less likely than a typical spoon to get big hunks of rice stuck to them. If you lose yours or don’t like using plastic, you can pick up a bamboo rice paddle at most kitchen stores. 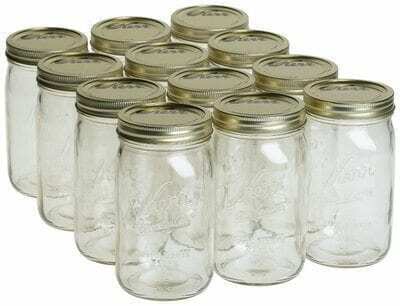 Canning jars are great for storing chicken stock, tomato sauce or anything else you can think of. Heck, you can even make loads of Hot chili Oil! If you ever tried the stuff, you may need these large jars but probably you want a smaller size. We use these jars all of the time for canning tomatoes after a summer harvest and storing beef stock for Pho or Lanzhou Spicy Beef Noodles, sauce we use for our Soy Sauce Chicken or just plain old homemade chicken stock. Ok, so these aren’t Chinese tools, but after the wok, cast iron pans are probably the most-used cookware in our kitchen today. We started using cast iron when we got fed up with buying and throwing away scratched non-stick pans. We cook so often that we need something that’s going to really last. Plus, once your cast iron pan is nice and seasoned, it’s practically non-stick anyway! Perfect for pan-frying buns, dumplings, and scallion pancakes. Durability and versatility. We’ve purchased non-stick pans that were supposedly high quality ($$$) products, but because we could never heat them over a certain temperature, they weren’t always usable for what we wanted to cook. And even the quality ones–no matter how much vigilance we employed in not letting metal spatulas ever graze their surface–would end up chipped and dinged, with the nonstick material flaking off. Maybe we weren’t the best at caring for those pans, but let’s put it this way, your frying pan shouldn’t really require kid gloves, should it? Cooking is messy business, and cast iron can take anything we throw at it. AND it’s a plus that these pans will pretty much last forever. I for one, look forward to passing these babies down to some great grandchildren or something. Do not place your cast iron cookware in the dishwasher. These pans come pre-seasoned these days, but it’s still good to clean it before using it. After cleaning, dry it thoroughly, wipe a thin layer of oil all over it, and heat it on the stovetop. After that, it’s ready to use! Just scrub it with hot/warm water and a brush or the abrasive side of your sponge after each use (no soap needed). To dry it, we usually give it a quick wipe with a kitchen towel and heat it on the stove to rid it of any excess moisture and to prevent rust from forming. Then, to keep it seasoned, you can just use a napkin or paper towel to wipe another thin layer of oil all over the surface of the pan. If you see a bit of residue on the pan as you’re wiping it down with the oil, don’t worry. This is normal, and will largely disappear next time you heat it. If rust does form, don’t worry. Just scrub the rust off with warm water. Then rinse it, oil it, and reheat it again. Don’t soak your pan in water for extended periods. This will lead to rust. If you have caked on food that you want to get rid of, pour in some warm water and bring it to a boil on the stove. That stuff will start to loosen and come up within 5-10 minutes. This Lodge 12-inch cast iron pan is the workhorse–we fry eggs in it for breakfast, make potstickers and pan-fried buns, and fry scallion pancakes. It’s the best. It even comes with a handy silicone handle cover. Yes! This reversible griddle/grill pan is the best thing ever. Just lay it across two burners, and you’re in business. We love this pot/pan combo cooker. The lid doubles as a pan. What what!?!?! These are key for sipping your soups and porridges without burning your tongue. They’re also the perfect size to cradle a wonton or a soup dumpling. Plus, they’re prettttyyy. 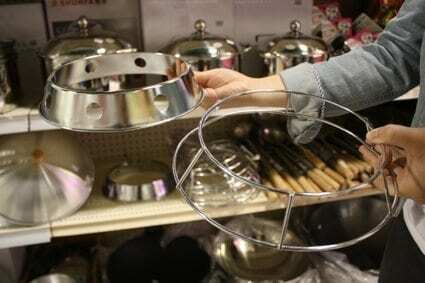 Serve up a heaping mound of rice in one of these bowls and just keep adding bits of food as you go along. It’s different from the American style of piling up your plate first and then digging in. 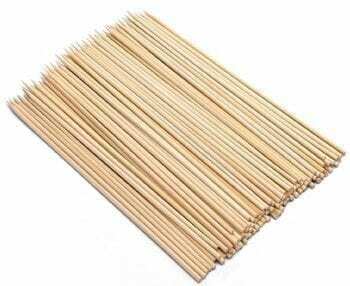 They’re also a handy size for preparing ingredients before throwing them into your wok. It’s the ramekin of the Chinese food world. That’s most of what we use in the kitchen to crank out our recipes folks! Questions about anything you see here? Comment below! I am so excited to have found your blog and especially your tools and ingredient glossary pages. I am new to Korean cooking and have found both of these pages very helpful. I am eager to try the recipes however I did find it somewhat frustrating that the recipes on the Tools and ingredient pages covered about a forth of the page and I could not read all of the description. Thank you for the time and effort you put in to make a quality site. Hi Janice, you’re welcome and glad you find these pages useful! Can you elaborate on what you’re describing about the recipes covering the pages? What device and browser were you using? Can you email me a screen shot at [email protected]? Thanks! Hi Karen, I don’t know of any non-stick hoak product like you’re describing––with all the scraping against the metal wok that you’d be doing with it, I wouldn’t recommend nonstick. The coating could scratch off pretty easily! Hi Ann, It sounds like the tool has reached its end of life and should be discarded. I don’t know where you bought yours or if you can even trace the manufacturer. If you decide to replace yours. be sure to dry it completely after use. Thank you for this informative site. What brought me to your page was a Google search for a particular wok tool that we got years ago. It was sold with the wok as part of a set. The wok is long gone, but the slotted metal utensil is stainless, albeit a cheaper quality of stainless, but good enough to have survived all these years. And it remains really useful for so many cooking needs. The only mark on the tool is “China-N” on the back side. Not sure I can include a photo here, but if you’d like to see it, and want a photo, please let me know. I’ve checked Sur-la-Table, Williams-Sonoma, numerous on-line sites, Restaurant Supply Stores, and we are leaving in a few minutes for Chinatown (SF) to see what the hardware and novelty shops there may produce. Hi Rathje, hopefully your trip to Chinatown went well! Is this a type of wok spatula you are describing? Love this post! How about high pressure cooker? Which one would you recommend? Hi Kimi, we use old school pressure cookers with locking covers that you heat over the stove, but there are many new electronic choices that I have heard work fine. Just stumbled upon your blog and I love it! I lived in Hong Kong for two years and crave the local cuisine. I am not much of a cook but am wanting to try each and every recipe on here. I am also writing because I currently work for Blendtec and the blender you have listed is quite old and not even made by us anymore! We have a lot of better blenders for a less expensive price than what is listed on Amazon for the 475. Also we now have 240V blenders for those who travel or live in other countries! Didn’t want to make that a sales pitch, just a friendly FYI. Thanks for all the great recipes and suggested cooking tools. Hi James, thanks––we will update the page ;-) These blenders are simply awesome! I just bought a wok, have never cooked dith one. I want a list of spices and suses and vegetables yhat is used in most common wok dishes. Hi Glenn, check out our Chinese Ingredients glossary HERE where we have lists and detailed descriptions and pictures! What can I do to avoid all my food stick to the bottom of my wok? I bought a middle price rather good quality wok a long time ago, I seasoned it as told but still when I cook there’s a layer of food sticked to the bottom. I peeked at the Chinese restaurant and none of the woks used there had such issue. They were beautifully clean after the use and I want mine to be like these too. I must do something wrong but I have no idea what it is. Help, help me please? It is really important to start with a very hot wok when cooking but temperatures and what you are cooking also matter. You also must make sure you spread the oil around the perimeter of the wok. For searing meats, heat until just smoking, and for rice and noodles dishes, a constant high heat is needed because if the wok cools down during the cooking process, things will start to stick. I am overdue for some additional pages and posts for these how-to methods of cooking so stayed tuned for future content!